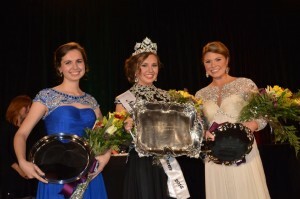 A QUEEN IS CROWNED AT THE 2015 NATIONAL WATERMELON ASSOCIATION CONVENTION! - What About Watermelon? You are here: Home / General / A QUEEN IS CROWNED AT THE 2015 NATIONAL WATERMELON ASSOCIATION CONVENTION! It’s February, which means the members of the National Watermelon Association (NWA) came together this past weekend for the group’s annual convention in La Quinta, California. The convention featured the usual meetings and seminars about all things watermelon, but the NWA members also took time to have a little fun. There was a seed-spitting contest and a watermelon-eating contest, but the highlight of the four-day gathering was the selection and crowing of the 2015 National Watermelon Queen. Regional watermelon queens from around the nation squared off in a grueling process to determine which one would earn the national title. Alright, it probably wasn’t “grueling” — in fact, I’m told the process is actually quite enjoyable for the queens — but the judges and potential queens definitely took the selection process seriously. In the end, the winner was Emily Brown of Vincennes, Indiana. Emily was previously the Illiana chapter Watermelon Queen and inherits the National Watermelon Queen title from Brandi Harrison. We interviewed Brandi here on the blog last year, and we’ll interview Emily in an entry in the near future. Until then, a big congratulations goes out to Emily on her new position as the queen of the watermelon industry!